We saw our first Ferrari today, and then two more and then some Classics out for a run in the glorious sunshine. Yes, at last the sun shone for us and it was wonderful. Rome was behind us and the drive to Siena was not too far today so we stuck very closely to the Mille Miglia route and enjoyed the views. 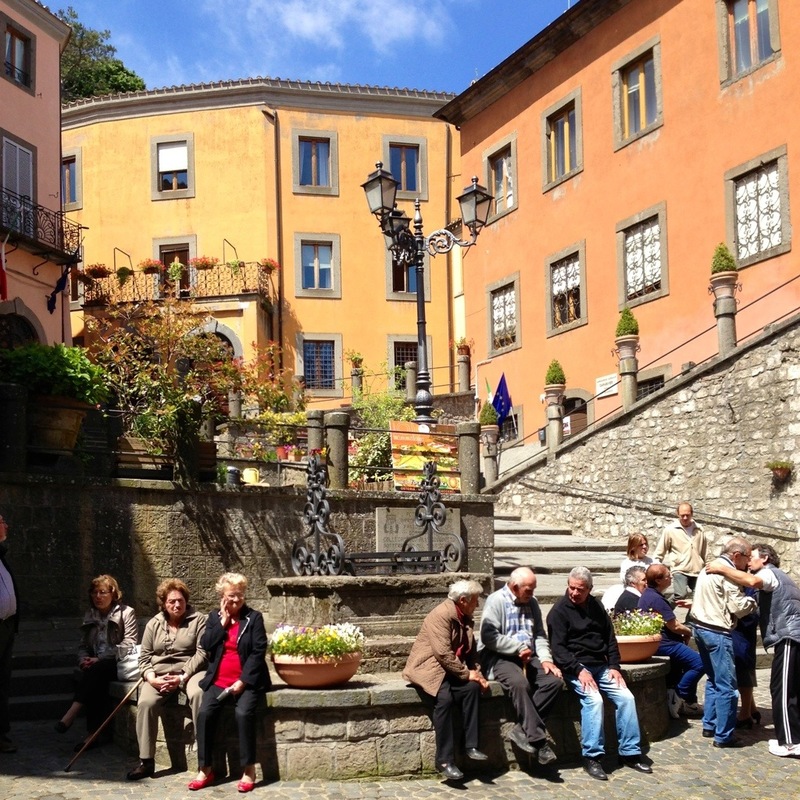 We skirted round a massive lake north of Rome and once more saw a very pleasing small town which would make an ideal coffee stop. 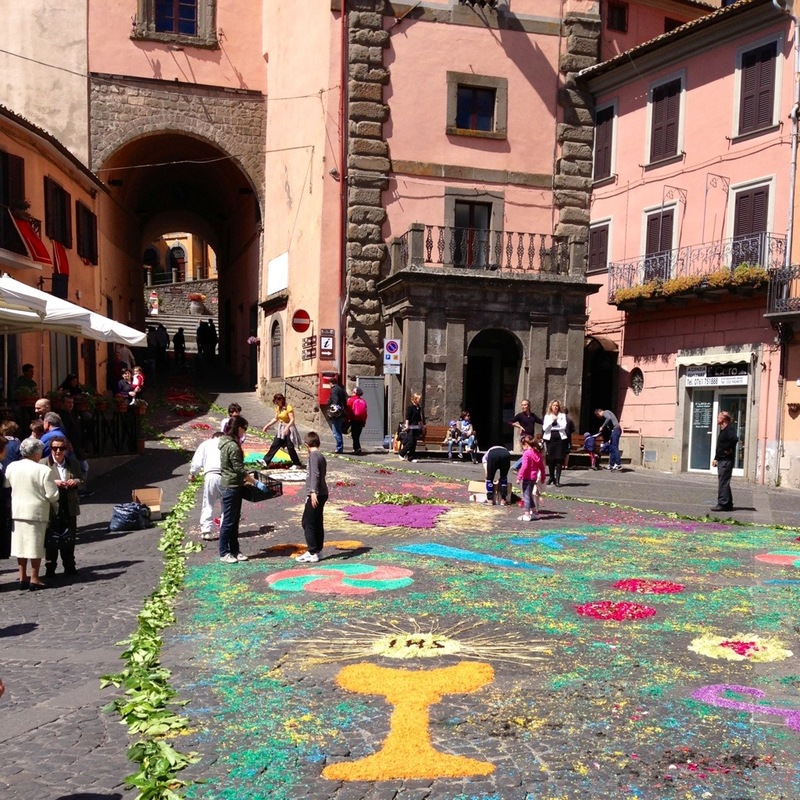 This turned out to be Montefiascone, a very attractive place at any time, but today the middle of the town was adorned with brightly coloured patterns, effigies and symbols, made of coloured wood shavings, rice, tinfoil, cocoa, pretty much anything. This decoration ran up the middle of the street on the ground, from the gate of the town to the church and it was along way. Today was Corpus Christi and this was part of their celebration, and it was a work of true commitment and pride on the part of those who did it, and a procession was to follow later. It was quite beautiful to see and we thought of the day that would be celebrated in Rome, at almost the same time, as a military parade had been planned around the Colosseum to commemorate the anniversary of the Republic. And there you have it. A small town in the hills was celebrating love and togetherness with beauty, whilst in the heart of Rome, they celebrated nationalism and might with soldiers. We preferred the simplistic beauty of the hills. 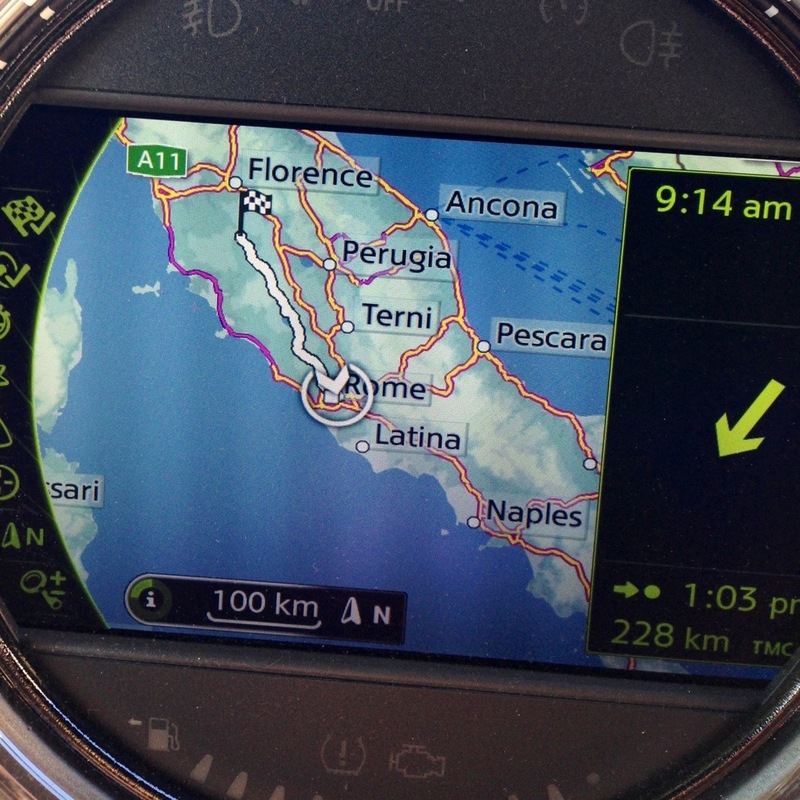 Off again and the lansdcape now was pure Tuscan delight and an absolute joy to drive through. It was Sunday, the traffic was light, the sun was shining and the scenery astounding. SilverBeast played his version of the 1812 overture on his exhaust to complete our joy. 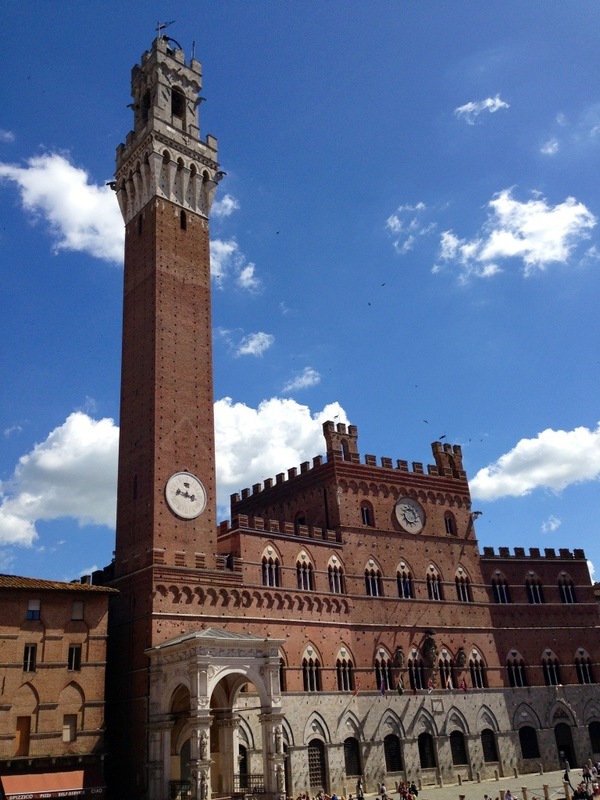 Next stop was Siena, which proved a bit tricky for us to get into even with two of us trying and a sat nav. Don’t get me wrong, the traffic was light and there was not the frantic chaos that you can get in a city, it was just that it was easy to miss streets and turnings for some reason. But once in the city we found our destination easily enough, checked in and used the escalators in front of our hotel to climb up to the centre of Siena. Once again, Super P had found the perfect place to drive to with quick and easy access to the old centre. 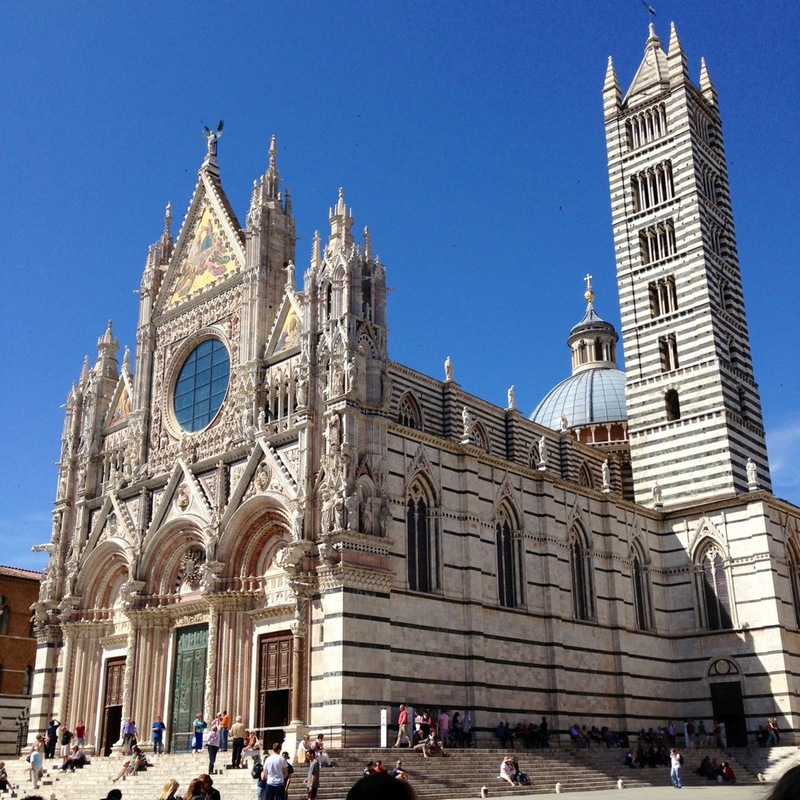 Siena is a very pleasant place to be right from your first entrance, but to go down the steps and into Piazza del Campo is simply awe inspiring. We had no preconceptions of the place and were quite blown away by the setting. 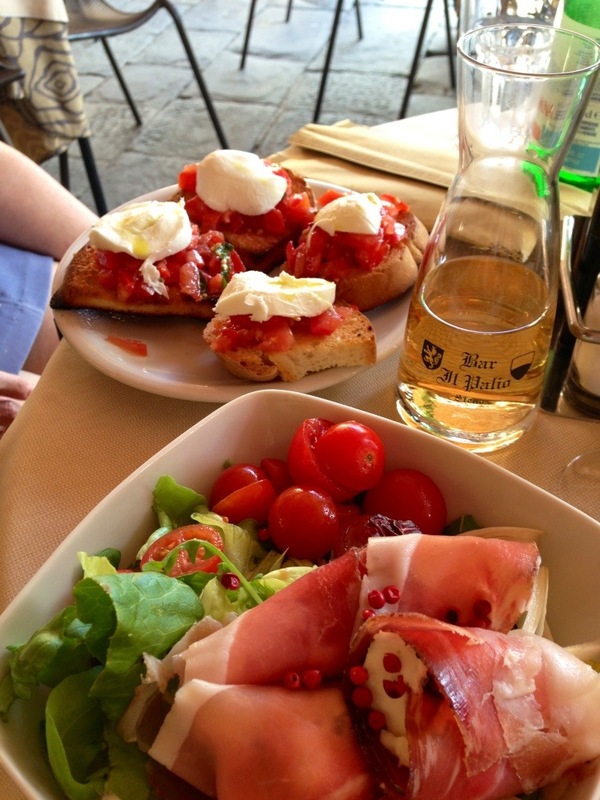 A light lunch of Mozzarella Bruschetta and smoked ham and Gorgonzola salad washed down with some Tuscan rose soon recharged us and we investigated this lovely place some more. 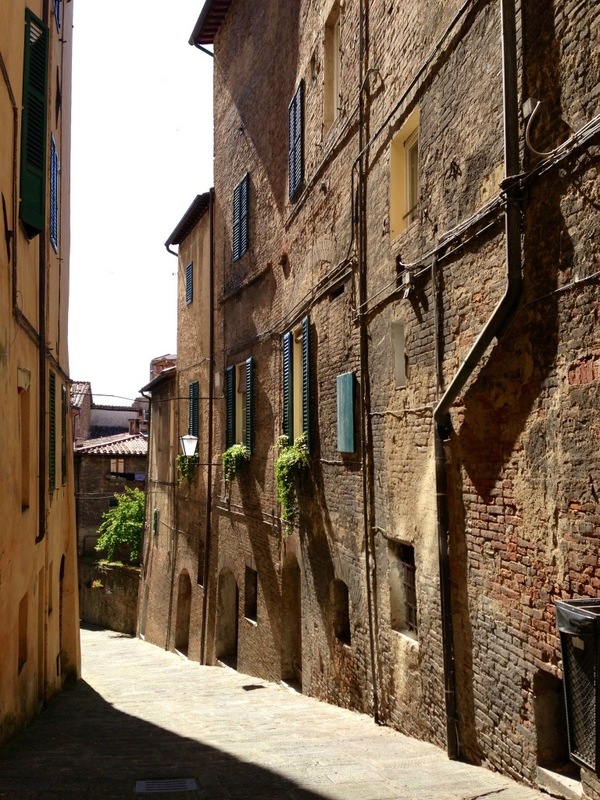 Siena isn’t a big place, but there are many interesting corners to explore. We soon found the Duomo and it immediately took us back to Florence last September. It was incredibly beautiful and the facade had a beauty in its symmetry that Poirot himself would adore. It was smaller than The Duomo in Florence but in its setting every bit as magnificent. As the sun was at that time shining on its incredibly ornate front, it was dazzlingly OTT, just someone showing off what enormous wealth they must have had to create such a thing. 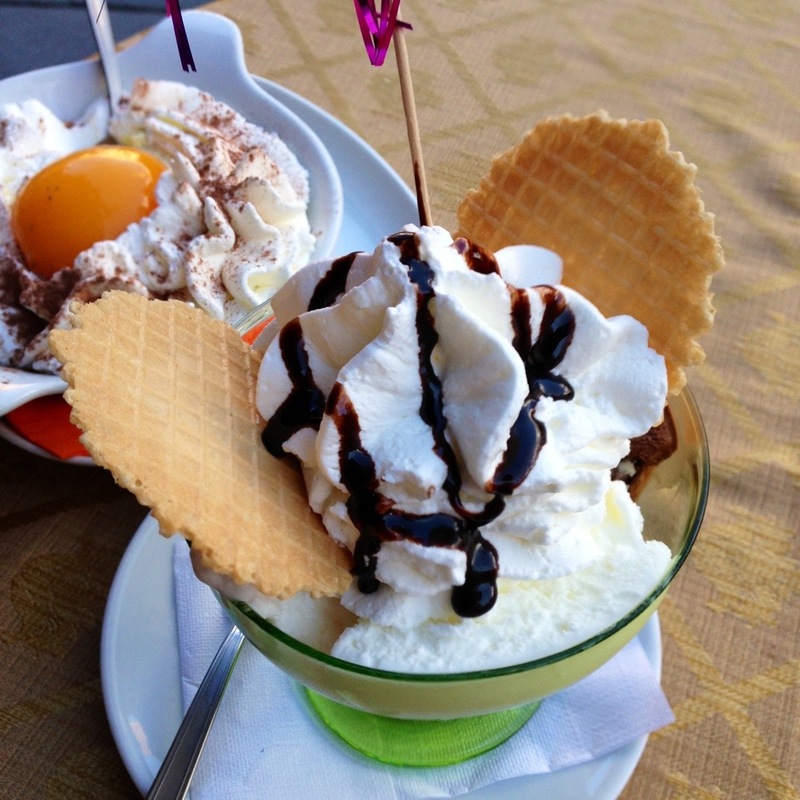 We soon felt the need for ice cream, so we treated ourselves to a proper job in a gellateria. Today was just how this holiday was meant to be, sun, fun and ice cream, with some nice views thrown in. We went back in the evening for a meal and a glass of vino, and waited for the evening to settle in. The Campo looked every bit as lovely at night gently lit, and we made a promise that we’ll go back soon. Tomorrow we head for Modena to see the glorious red machines.